One of the most common tests undertaken in laboratories producing monoclonal antibodies is the determination of antibody isotype. This basic test is of vital importance as the isotype of the antibody has implications for functional activity, purification strategies and long-term stability. 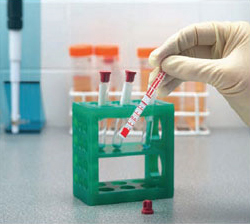 Many current isotyping techniques, such as ELISA assays, take a considerable amount of laboratory time and require the testing of all samples for each isotype, thereby substantially increasing the workload. To address these problems Bio-Rad presents rapid test assays that can give accurate results. Our rodent antibody isotype kit can give you accurate results in under 10 minutes. Our rodent antibody isotyping kit products are based upon well proven dip-stick technology. 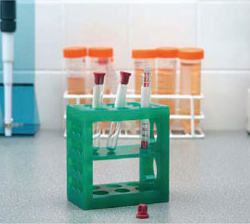 They contain all the reagents necessary to test antibodies without the need for any instrumentation. These isotyping kits have high sensitivity for isotype determination during very early culture. They are able to identify all classes and sub-classes of mouse and rat immunoglobulin, including kappa and lambda light chains. Fig 1. Rat antibody isotyping kit strips. 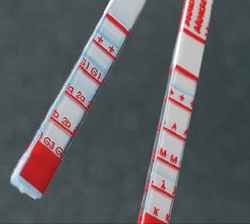 For a permanent experimental record or for an easier interpretation of results when testing multiple samples, the solid red area may be cut off the bottom of the strip to prevent further band development once the positive flow control bands have appeared. A gentle stream of air could be applied to the membrane portion of the strip to assist in drying the membrane and preventing any further development. Do not wash the strip to stop the reaction. Fig 1. 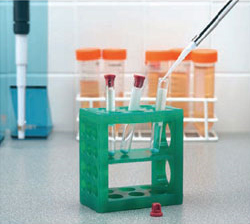 Pipette your monoclonal antibody into a development tube containing our special microparticles. A complex will form. Fig 2. Insert an isotyping strip and wait for 5-10 minutes. Fig 3. The complex will aggregate as blue bands on the strip corresponding to the antibody isotype and light chain. Fig 4. Our kit contains all the reagents needed (except for PBS/1% BSA) to perform 10 highly accurate tests. For more information about how to use these isotyping kits read our technical advice and FAQs page.